The IIT brand genesis is held in high regard in the US. I attribute any personal professional success whatsoever, to the solid fundamental learning experience at St. Columba’s High School and more so, the five years at IIT. In 1964, around 33,000 took the entrance exam and about 1000 were selected. Or one in 33 got selected. I believe the competition is even more severe nowadays. Almost every IIT-ian I have met since 1969, has impressed me with above-average professional credentials as well as a certain aura of self-confidence. I have also met a whole cadre of non-IIT-ians in the high technology industries of San Francisco and Seattle, who are brilliant, creative and outstanding contributors to society. Obviously there are many, many Indians worldwide without an IIT genesis, who have very impressive professional credentials. I wish we have more women IIT-ians. In our day, the IIT Madras curriculum was definitely a deterrent to women primarily because of the German focus on hands-on, manually-intense workshops; we used to come back with our khaki shirts literally soaked in sweat. If we consider those who just missed being selected to IIT and the number of potential women engineers, the raw, accessible talent pool in India for IIT type of training increases significantly. The dilemma is how to increase the number of IIT-types of graduates while maintaining its standards and not diluting its reputation and strengths. Personally I feel we could add a few more universities with IIT-types of curricula; primarily because there is an un-tapped talent pool available and we do need more trained people to make a positive impact on industry and society at large. Maybe my story will help. Growing up in Delhi and finishing high school at St. Columba’s made me a firm believer in team synergy that could result in individual success. That was the genesis of my intensely competitive, yet team-oriented spirit that carried into my IIT days. Subsequently, this spirit has been with me through my entire professional career. At IIT I instantly made many new friends based on shared interests and backgrounds. The decision to select the High Current (HC) elective in electrical engineering was simple: all the real brains in electrical engineering (Jayant Baliga, Vikram Prabhu, Sriram, Anantharaman, Desikan, etc) had already opted for Light Current (LC). One of the major learning experiences at IIT was inter-personal communications and that with proper interactions you could almost always negotiate positive win-win results. The group and personal dynamics that we experienced in the mess halls, classes and sport fields were all rewarding growth experiences that help me to this day. I also learned the power of verbal communication; explaining and translating complex things in simpler more understandable terms. I did not realize it at the time, but the November 1965 blackout in New York (in our second year at IIT) turned out to be a watershed event for the future career that I eventually pursued. Maybe, in some subliminal way, that reinforced my choice of HC (or dealing the electrical power systems). I was of 5 selected for the Indian Railways Special Class Apprenticeship (SCRA) in my second year at IIT. I turned it down much to the dismay and chagrin of my dad (he had applied for it in his Guindy college days and was not selected). My goal was to study computer applications to solve complex power system problems. The decision to work in power systems was reinforced by the timely congruence of the evolution of digital computers and the fallout from the 1965 blackout which placed a high industry focus and increased research funding to make sure it does not happen again (and that we always ‘keep the lights on’). After IIT, Vikram, Desikan, J Srinivasan and I joined SUNY (September 1969). I had twinges of guilt leaving and sort of abandoning India after the great education investment I had experienced at St. Columba’s and IIT. After SUNY, it was time enter the real world and see how I would fare. My first job in the U.S. came in 1978. I was hired by Systems Control (SC) of Palo AltoCA. We researched the causes of outages and developed tools and techniques to prevent blackouts. We researched and developed advanced real-time power system analysis software for monitoring the electric grid. The software we developed used data received every 2-4 seconds from the power system and assessed vulnerability to a potential imminent blackout. This real-time suite of applications is called an Energy Management System (EMS) and every electric utility in North America and most utilities in other countries, use one today. Typically power companies run one or more of these EMS suites in a centralized ‘control center’. These control centers are now considered the ‘nerve center’ of the utility. These control centers receive measurements from across the wide expanse of the grid, analyze and correlate the data, and recommend protective and/or corrective actions to maintain the integrity of the grid. While the 1965 Northeast US blackout was the genesis of the modern day digital-computer based EMS, it did not ring the death knell for unplanned outages. Subsequent numerous blackouts continue to occur across the world today. They have varying degrees of widespread impact and almost always make the headlines. If there is a silver lining to a blacked-out cloud it is that every blackout leads to a boost in the EMS business. The last major one was in August 2003, again in Northeast U.S. Hence again another wake-up call to the public saying that we cannot take 7/24 electric power for granted. The primary objective of the EMS is to ‘keep the lights on’. This is a 24/7, second-by-second mission. In 1978, Digital Equipment Corporation (DEC) introduced the new DEC VAX/VMS computer; its operating system was ideal for interrupt and event-driven real-time EMS applications. A group of SC managers felt that it was time to make SC develop its own EMS product and not be a sub-contractor. Since SC corporate refused to invest in the development of a new VAX-based product, three of our senior managers along with nine others engineers decided to venture out on our own. Ironically a few years later SC itself migrated to the VAX and became our competitor. In December 1978, 12 of us (all power system engineers) started ESCA – Energy Systems Computer Applications. We sold our houses in the inflated real-estate market of the San Francisco bay area and raised about $1Million seed capital to start ESCA in Bellevue, WA. My primary focuses at ESCA were the design and development of the automatic generation control (AGC) applications and the power system dynamic simulation applications for the training simulator. AGC is the only closed-loop EMS function which automatically issues controls to generators every 4-10 seconds. This is done in order to follow load, maintain frequency, and maintain scheduled interchanges with neighbors. All other EMS functions are for monitoring and review and actions have to be implemented manually by an operator. Cegelec France took a minority ownership in ESCA in the 80s and eventually bought out the ESCA share-holders in 1990. The fast changing merger and acquisition environment of the 1990s saw Cegelec acquired by ALSTOM T&D in 1992. More recently, AREVA France acquired ALSTOM T&D in 2004. Our first significant revenue check for $500k came in 1981 from GE when they purchased an early version of our software to capture disturbance data at nuclear plants. Our big break came in December of that year when Gulf States Utilities in Texas awarded us the first true real-time EMS project. The 1980s and 1990s were a period of prosperity and growth for ESCA. I became a more experienced engineer and manager and ESCA pioneered investments in the diversification of control center product solutions. The 1990s also created new challenges due to electricity deregulation. The industry and the government both wanted to create a free market so that customers could choose their suppliers (similar to what was done in the U.S. telephone and gas industries). During the early 1990’s we were bidding on EMS projects for the North and South regions of India. 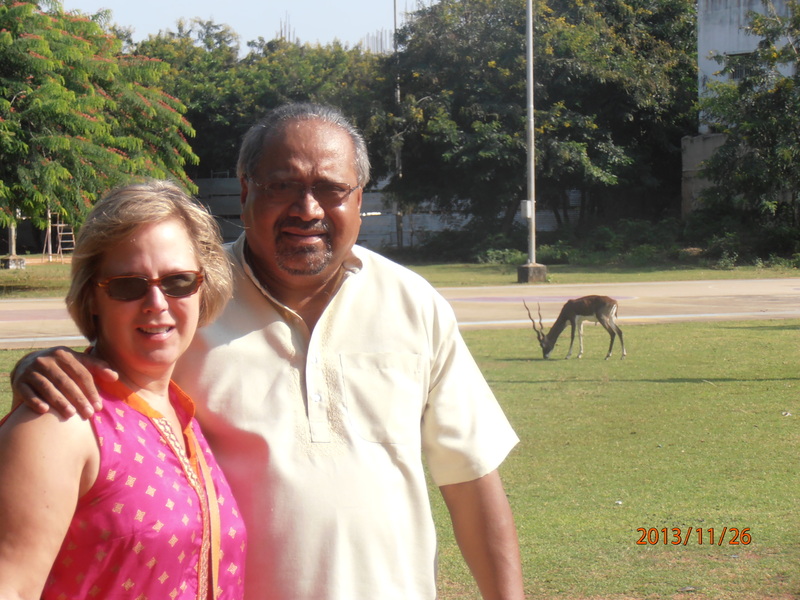 The major benefit was that I got to visit Delhi 3-4 times a year for many years. Getting to stay in a hotel a mile from where I went to school and meeting old IIT friends like Mandip and his wife Parminder. The best part of the trips to India of course was the food. Indian food is a life-long addiction. I have evidenced this with many of my U.S. friends here who were more recently introduced to Indian cuisine. One of the first Market Management Systems (MMS) we deployed in the 1990s was in New Zealand. This was followed by one Australia and then a few in the U.S. While our EMS solutions were designed to minimize costs, our new MMS solutions focused on maximizing profits (within the pre-defined rules of engagement). The EMS and MMS need to co-exist in the control center. In the end, however, the EMS always has priority in terms of doing whatever is necessary during an emergency to keep the lights on. Today’s ESCA is AREVA T&D Inc. AREVA T&D is considered one of the leading global suppliers of control center technology. Annual, global EMS and MMS control center business revenues exceed $250M.We have grown to about 400 staff in Bellevue, 250 in Paris, 150 in Noida, India and about 50 in Brazil; all delivering AREVA EMS and MMS based products worldwide. Our major competitors in the global market are ABB, Siemens and GE. We are fortunate to have the dominant MMS market share in the U.S., Australia, New Zealand, and the dominant EMS market share in the US, Australia, NZ, Greece, Korea, South Africa, Vietnam, and most importantly (from my personal perspective) India. I remember the tremendous thrill and adrenaline rush in South Africa when I was at their control center, watching AGC issue controls every few seconds to the massive rotating machinery of generating units all across the country in order to maintain the country’s power system equilibrium. Over 60% of the US generation is under control of the AREVA AGC; a personally gratifying feeling that software we developed is running 7/24 maintaining the integrity of the US power grid. Three of our original 12 founders have been here since 1978. One returned after a 10 year hiatus and two others continue doing part-time contract work with us. The fact that some of the state-of-the-art technology we developed in the U.S. was eventually brought back to support the Indian power grid infrastructure and that we grew an EMS staff of 150 at Noida, was personally satisfying to me. Today our EMS software is implemented in over 250 control centers world-wide. In my mind the EMS deployments which most benefit society are the national control centers which monitor and control the power system grid of an entire country. In fact the deployment that impacts the largest cross-section of people or human beings, are our EMS control centers implemented across India. The US National Academy of Engineers (NAE) consists of an elite group of all genres of engineers. It consists of just 2216 U.S. engineers and 186 foreign associates. In 2000, it conducted a survey of its members to identify the “most significant engineering achievement of the last century”. “Electrification” was voted number one; just ahead of automobiles and airplanes. Internet was at 13. It is serendipitous to have stumbled into a profession involved in maintaining the integrity of the ‘greatest achievement of the 20th century’. I still feel good about being pushed into selecting the HC option. Unfortunately the power grids in the U.S., and most parts of the world, are old and essentially getting antiquated. The equipment (lines, transformers, generators, circuit breakers, relays, etc) is, on average, almost 50 years old. So more technology and tools are required and are essential for maintaining its successful operation. The interconnected grid is spread across a large geographical area and extends into remote, uninhabited locations. Unfortunately, the grid is very vulnerable and could easily be attacked to result in blackouts of large cities. Nowadays, EMS control centers are the primary technology used for the successful operation of the interconnected power system grid. It is based on a centralized command and control paradigm. The future will evolve towards more decentralized intelligence and localized control. An evolution towards a ‘self-healing power system grid’ is likely; akin to the human body which quickly identifies an intrusion and tries to heal and locally coagulate the intruded area in order to preserve the integrity of the rest of the human body. We are likely to see more generation sources closer to the loads; residential sub-divisions could have their own local fuel cell which supplies power to 20-30 households. This would reduce our dependence on the transmission grid to transfer power from remote locations to populated load centers. As their deployment costs become more competitive, we are also likely to see a growth in renewable generation sources such as wind power, solar cells and possibly geo-thermal and tidal basin power. We will see more customer control based on time of day or instantaneous price signals. In other words, customers would be able to monitor the current price of electricity and decide whether to turn on the dishwasher or not; a form of home-static control. This will tend to flatten the load curve demand of the utility and will make generation dispatch more predictable. New types of measurements such as phasors are being deployed aggressively world-wide. These provide globally synchronized voltage and current phasors (magnitude and angles) at up to 60 samples per second, which will make assessment of grid conditions easier and more promptly. Another challenging force to reckon with is the aging of the workforce in the electric power industry in the US as well as in most other countries. The 1965 blackout created a workforce boom which attracted top electrical engineering graduates in the US into power. These boomers are now looking at retirement; over 50% of the workforce will be eligible to retire in the next 5-10 years. This creates new opportunities for training new staff and also the necessity to develop new automated tools which can move us towards a more intelligent, responsive self-healing grid. I have been asked why I do not retire and spend more time on trying to improve my golf handicap. I guess because work is still so much fun and extremely satisfying. It is a tremendous sense of satisfaction to see the products developed by your company, being used 24/7 worldwide to maintain the integrity of the power system. It is also immeasurably satisfying to see our staff grow and help customers, many with antiquated power grids, with the challenging task of keeping the lights on. In closing: I am profoundly thankful for the opportunities and fortuitous breaks that life, schools and the U.S. has provided. Especially, for the once in a lifetime kismet of bumping into a group of specially gifted individuals whose synergistic ideas and solutions have made a small positive impact on society. Most of all, I am thankful for the roof over my head, food on the table and good physical, mental and emotional health: after all, they are the essential success factors in the relentless, life-long pursuit of improving one’s golf handicap.